Tip: Engage with your baby and get rewarded in giggles! Tip: Get educated, get support and look after yourself (for more resources, see below). Dr Debbie Smith (Manchester University) emphasises the importance of social support for new mums. She said: ‘Evidence reports that the type of support desired by women changes at different stages of pregnancy. Support from other mothers is desired after birth and the best way to receive this is to attend mother-baby groups.’ A range of such groups exist these days, including baby massage and yoga. Dr Smith says these groups can help increase confidence and attachment. Tip: Try different baby groups: don’t be put off by the group’s name, as any can have wide benefits for both you and baby. 4. Dads and partners matter too! Tip: Involve yourself in the fun and laughter of rough and tumble play every day, and watch the bond between you and your baby grow and grow! Tip: Talk to your child, whatever the language. Tip: Sleeping in daylight with noise is good for later night time sleep patterns. Tip: Hold your baby to provide calmness and comfort. Punit Shah (Kings College London) points out that, as they have poor vision, babies’ senses may be overwhelmed by sensory input. He adds: ‘However, research, pioneered by Professor Mark Johnson, shows that infants show an attentional bias for faces, which channels a wealth of social information into their rapidly developing brain.’ This doesn’t just help them to process familiar faces but likely contributes to the formation of the brain networks that govern social abilities in adulthood. 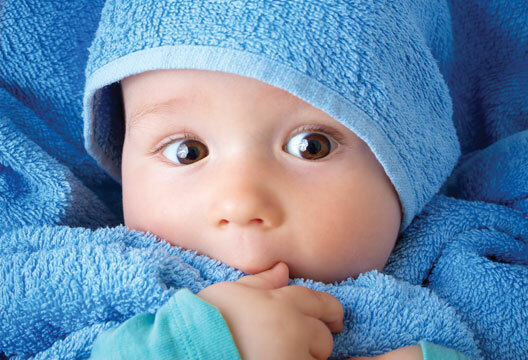 Tip: Babies look for much longer at faces illuminated from above than from below. Sitting with them below a light may help them to engage with you. Tip: Be prepared for breastfeeding, plan ahead and use the services available. Tip: Respect your feelings as a parent, and be open to your child as an individual. Read more in the January issue, including why demography needs psychologists, and reproductive health matters. This guide went out with every copy of the January edition. One of our readers, Elizabeth Day, was particularly interested as she is a parenting consultant for Mothercare UK. She took the guide to them, and they asked us if they could print 25,000 of them to distribute to new parents at their in-store events. We are absolutely delighted that our very first 'Guide' is having this kind of impact. Mothercare also kindly printed an extra 5,000 copies for us. If you would like a single copy of the guide, please download and print the PDF below. But if you work with new or prospective parents and feel you could help us get the guide to significant numbers of them, drop our editor an email on [email protected] with a postal address and number of copies. Coming soon… No 2: The Psychologist guide to… leadership.